“Write a 75-minute play in the style of Samuel Beckett.” This seems to be the task Rick Roberts set himself and he has fulfilled it admirably in Kite. Yet, while writing pseudo-Becket may benefit the author, it may seem a pointless exercise to an audience familiar with the real thing. Two men dressed similarly enter a set dominated by a single tree. One waits for someone who never appears. They have inconclusive philosophical discussions and misquote Shakespeare. So far it’s Waiting for Godot. One has binoculars that to peer at the rest of the disgusting world (Endgame). Eventually one literally falls apart until he is only a talking head lying on the earth (Happy Days). The theme is one of Beckett’s favourite’s--the hellish paradox of the infinite mind trapped inside a finite decaying body. If Roberts were commenting on or reinterpreting these familiar ploys of Beckett’s there might be a purpose to what seems hopelessly derivative, but, in fact, Roberts is using Beckett’s means to achieve Beckett’s ends. 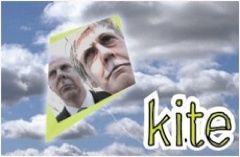 Taken as an obsessive homage, Kite is still quite funny. Oliver Dennis gives an excellent performance as Man One, who is attempting to retrieve his kite from a tree. His comic timing is perfect and his attempts to recover propriety after increasingly severe physical breakdowns are hilarious. Marjorie Campbell is less successful as Man Two, who has set out a picnic for a beloved whose name he can’t quite remember. Just as her “old man” makeup is overdone so is her acting that never approaches Dennis’s subtlety. Photo: Oliver Dennis and Marjorie Campbell. ©2004.